Winter weather means warmer suits, layering and luxurious overcoats, scarves and gloves. 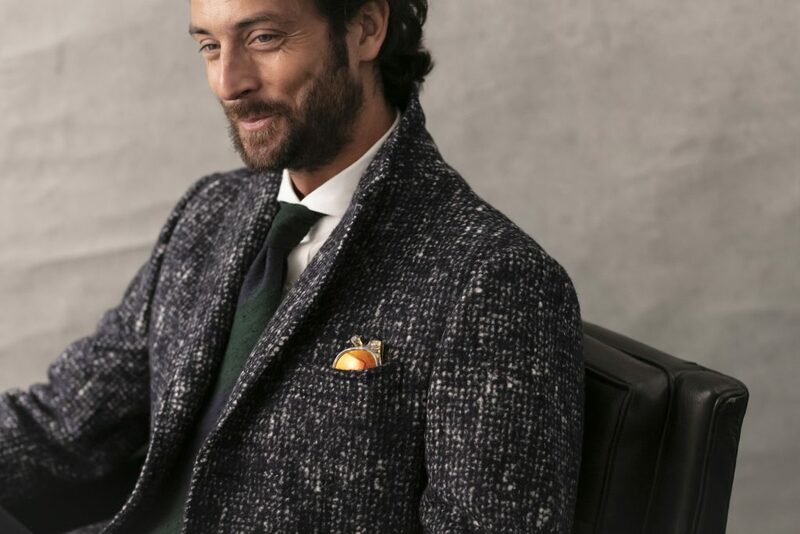 Understand the difference between worsted wool, flannels and tweeds as well as cashmere so that you can decide the best fabric to suit your winter wardrobe requirements. comes in different weaves: worsted, flannel or tweed. Worsted wools are the most popular for suiting and the most common weaves include plaid, hounds tooth and nail head. Worsted wools are typically mid weight and are good for year round wear. Flannels and Tweeds tend to heavier weights and are preferred for winter suiting and overcoats. is another great winter fabric perfect for suiting. Flannel fabric is soft and light. Through its finishing process, called napping, the fibers of the fabric are raised, making the fuzzy and soft texture improving insulation. Flannel can be woven in plain or twill weave and is great for fall or early winter wear. Add our Madison Navy Flannel Suit to your fall / early winter wardrobe. Made with a versatile flannel wool from Italian mill Vitale Barberis Canonico, the Madison Navy Flannel suit is comfortable, durable and will be a workhorse in your closet. can be divided into lighter or heavier weights. Lighter tweeds are good for suiting, especially for warmer winter wear and colder climates. Heavier tweeds are great for overcoats and jackets. Tweed tends to be rougher and more hardy than worsted wool or cashmere and is made from either a plain or twill weave closely woven together to create herringbone or check patterns. The hallmark tweed look is created when differing colored woolen strands are twisted together into two or three ply yarn prior to weaving. The most notable characteristics of tweed are its moisture-resistance and durability, making it excellent for sport coats and outer wear. is a softer, lighter yet still strong fabric made from the hair of goats (notably goats from Kashmir). The hair is combed rather than shaved and this creates a softer, finer finish. Cashmere is a luxurious, warm fabric that breathes and can be worn in winter and spring. It also travels really well and doesn’t wrinkle, making it perfect for business trip packing. It’s incredibly durable and high quality cashmere clothing can last a lifetime. Knot Standard’s Classic Navy Overcoat is the freshest blend of cashmere and wool to keep you warm all winter long. Order yours and ask for customized detailing including slanted pockets or double vents.